U.S. District Court Judge Virginia A. Phillips did something unremarkable Tuesday: She ordered the government to stop enforcing an unconstitutional law. But her ruling made headlines because the law in question was the military's "Don't Ask Don't Tell" policy, and the judge's order means gay people can serve in the military without hiding their sexual orientation. Once the judge ruled on Sept. 9 that the law violated gay soldiers' First and Fifth Amendment rights, Tuesday's injunction barring the law's enforcement nationwide became essentially inevitable. That didn't stop the federal government from asking the judge to issue a very narrow order, however, limiting its effect to soldiers who were also members of the Log Cabin Republicans, the gay rights group that was the plaintiff in the case. If the government had had its way, it would have inserted a bizarre variation into Americans' core constitutional rights to free speech and due process: People's membership in the Log Cabin Republicans, not their status as citizens under the Constitution, would determine the extent of their constitutional rights. Judge Phillips' findings of fact and conclusions of law make important reading because they dismantle the core justification for Don't Ask, Don't Tell: the idea that openly gay soldiers have a negative impact on military readiness and unit cohesion. The government cited seven pieces of evidence -- three reports and the testimony of four experts, including retired Gen. Colin Powell. Neither the reports nor the experts pointed to any empirical evidence to support claims that openly gay soldiers hurt military readiness or unit cohesion. In contrast, plaintiffs introduced strong empirical evidence that the Don't Ask, Don't Tell policy actually hurt military readiness and unit cohesion: Among other issues, the policy resulted in the discharge of some 13,000 otherwise qualified soldiers at a time when the military was heavily committed and understaffed. Strikingly, though, discharges decreased after the war in Afghanistan started, even though overall military membership increased, a result that suggests that during wartime, when soldiers were most needed, the military found it preferable to have gay soldiers serve rather than discharge them for their sexual orientation. This inference was backed up by other evidence showing that discharge proceedings for being gay were delayed while soldiers were serving combat missions: Only after soldiers returned from combat would they be discharged. That practice is impossible to square with the idea that gay soldiers undermine either unit cohesion or military readiness. Plaintiffs also showed that discharged service members had particularly vital skills, such as fluency in foreign languages, and that the policy negatively impacted military recruitment. But the plaintiffs' most emotionally compelling evidence was the testimony of decorated and admired career military members who were discharged because they were gay. One was outed involuntarily: Someone violated military policy to access and read his personal emails, one of which revealed he was gay, triggering his discharge. One served openly for over two years without incident and was decorated repeatedly, until proceedings were brought to discharge her. 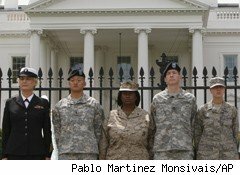 A total of five discharged gay service members and one heterosexual one who refused to reenlist because of the policy testified compellingly during the case. Obama's Position: Personal or Political? Gay rights have had a banner year in the courts, which have struck down as unconstitutional one state's gay marriage ban, the federal ban on recognizing gay marriages and now Don't Ask Don't Tell. President Obama has gone on record as supporting gay rights, and in particular an end to Don't Ask Don't Tell. Despite this, his administration has defended these unconstitutional laws, and in the case of the statute barring the federal recognition of gay marriages, has appealed the ruling. Presumably, the administration will appeal this ruling too. That must mean that President Obama's support of gay rights is more a personal conviction that a public policy matter, in which case, who cares? People don't get elected for their private views unless those views are translated into policy. It's no defense to say the Obama administration is trying to repeal the act through Congress: It could continue to do so without appealing Judge Phillips's order, on the grounds that it wants legislative as well as judicial action on the issue.